We keep an eye on Pantry Moth Traps here at PantryMothTrap.com! It’s an odd thing to say, because there really has not been much change in the world of Moth Control specifically via Pheromone lures. 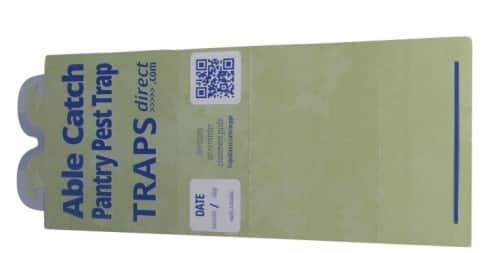 We heard rumors last year that Traps Direct was entering the moth trap market with a couple design innovations. When it comes to moth trap design, the changes are innovative to be conservative or ‘wow’ to be effusive. So what’s the buzz? The science of the Female Indian Meal Moth Pheromone ( Plodia interpunctella ) was discovered decades ago. There have been a few changes in the lure system. Some traps use a lure integrated into the glue ( which has mixed results, especially if the entire trap is not air tight during storage), but most traps use a pheromone soaked chip that is placed on the glue. Basic glue based moth trap design comes down to a paper board that folds into a triangle. Advances in the design have not happened often. The most stirring was a Moth Trap that had an arc or arch, fastened by a rubber grommet. This frees the upper portion of the tab to be used as a mounting system. The outer quarter inch round of the tab is pre-cut and tacked at the halfway point to enable TAB WING Hooks, Loops or a even just to tuck into a surface. Instead of a triangle, Able Catch Traps have added another side. Typically moth traps have avoided a square, because of the tendency to collapse on itself. But the Able Catch Trap is using a “trapezoid” which has the each side slightly different in length, when crushed the trap deforms into a triangle preventing collapse. There is no package, Able Catch Traps are designed for an e-commerce world, no UPC code, only a QR Scan Code. No wood grain or plain jane exterior on this trap. Instead a Natural Stone pattern with a leaf green color blend into modern kitchens. First came across Able Catch at our local bird club meeting. Smart move to send early samples to bird owners since we struggle with pantry moths. The only request was direct honest feedback. The early moth trap was blue, but many of our club asked if it could be in green because it blends better… and guess what… next samples were in green! Natural traps, with single lures and a big bullseye to drop the lure onto make it easy to use. Our favorite feature is the Tab Wings, most of us hang the traps from the bottom of the cage, under the drop pan… Before tab wings we had to tape the traps to the stand….